There is just something about the Star Wars space opera that has had its fair share of fans with each passing generation (so far). Having made its debut a good 30 years ago, we wonder just how much farther can this cash cow be milked? Well, for quite some time more, we suspect. 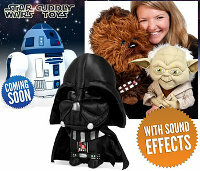 Just check out these Star Wars cuddlies that won’t break the bank at £29.99 each, where you can choose from R2D2, Darth Vader, Chewbacca and Yoda designs. All of them will come with their own characteristic sound effects, where R2 will beep a whole lot, while Darth Vader seems unable to clear his throat (with all the money and power at his disposal, he can’t even find a good specialist), while Chewbacca yaps away like a distressed walking dog with old man Yoda rambling on and on. All it takes is a single squeeze for them to make a sound or phrase, how cool is that?